Some years ago (31, to be exact) we bought our first sofa together. I remember that it was difficult to reach agreement (which has not changed one bit in the 31 ensuing years) and we ended up paying somewhat more than we expected. 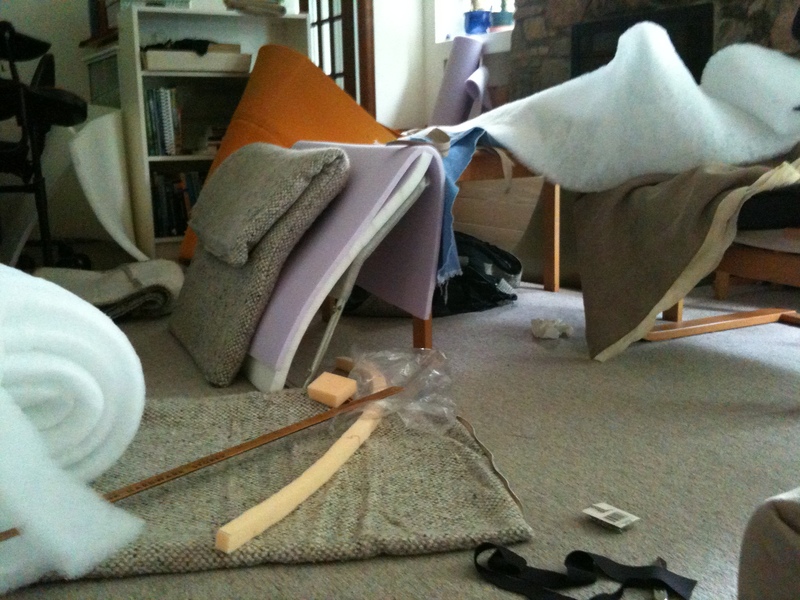 However, I thought at the time that it was a well-made well-designed sofa that would age well and some day (maybe after 10 years) I could re-upholster it. That was because it was simply a metal frame covered by foam and fabric, stitched and bolted together, and I was handy with that sort of thing. Recently when we remodelled the living room, the kids laughed at the old sofa, although I thought it looked pretty good for its age and for having borne 3 children. (I was sympathetic with it.) 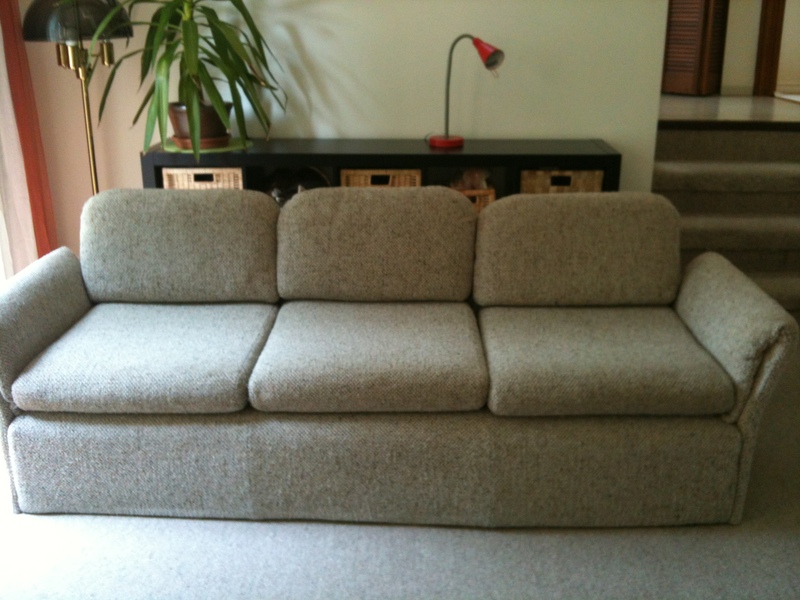 So we got a new one (sofa, not spouse) – also hard to agree on and costing more than we planned! The old one was relegated to the un-renovated family room. When Husband went away for a month I decided to clean up the family room (somewhat) and restore the sofa.It turned into way more work, costing way more than I expected, but I managed to stick with it through to completion. Once I realized the scope of the task, I decided to get all new materials since I never wanted to do it again. So the product is now totally new except for the metail frame and one long zipper. Base tilted up so you can see the bottom. Covering the foam are two zippered layers – one lengthwise, the other crosswise. 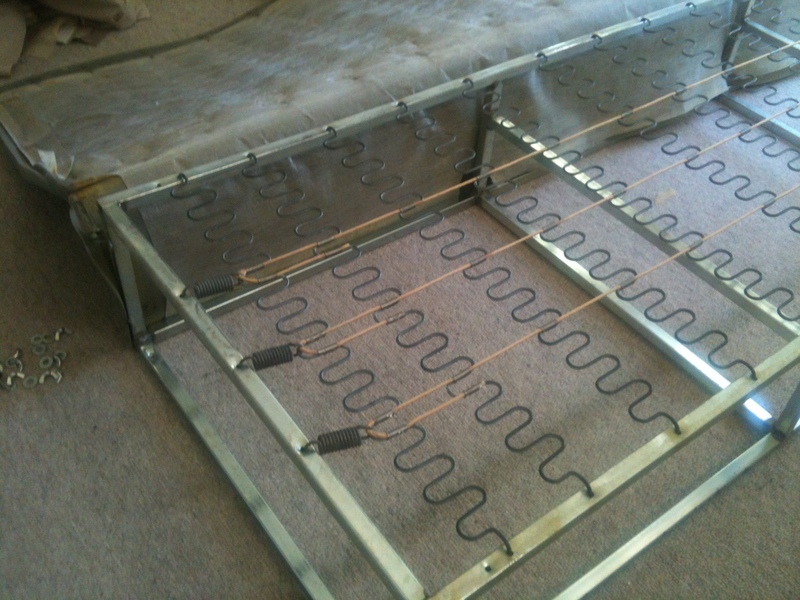 Gaps in the edges allow additional arm access to the bolts through the metal frame. New foam is firmer than old foam, so if you make the cushion covers to fit the old foam, you will have to remake them to fit the new foam when you finally get it. 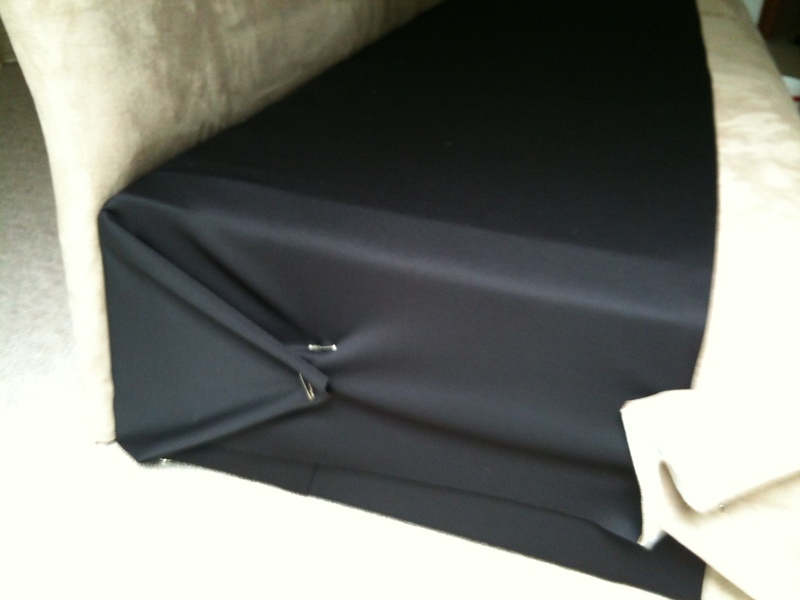 If you don’t plan for this, you will have to insert gussets at the back of the cushion covers to make them bigger. If you don’t have enough cow print left, you will have to piece together some zebra fabric. Since it is at the back, no one will notice. So, you will have to pull the cushion out to show them your admirable work. Every single seam will be sewn, ripped out, sewn and often ripped out and sewn again, all in order to get the right fit and degree of tautness. This is an opportunity to use up vast quantities of strange colours of thread you have collected over the years. Most of the stitching is out of sight, and you’ll be stitching every seam 3 times, as mentioned. Remember that if the parts are bolted together (i.e. arms and back to the base) you need to be able to reach your arms into the innards to screw them together at the end. 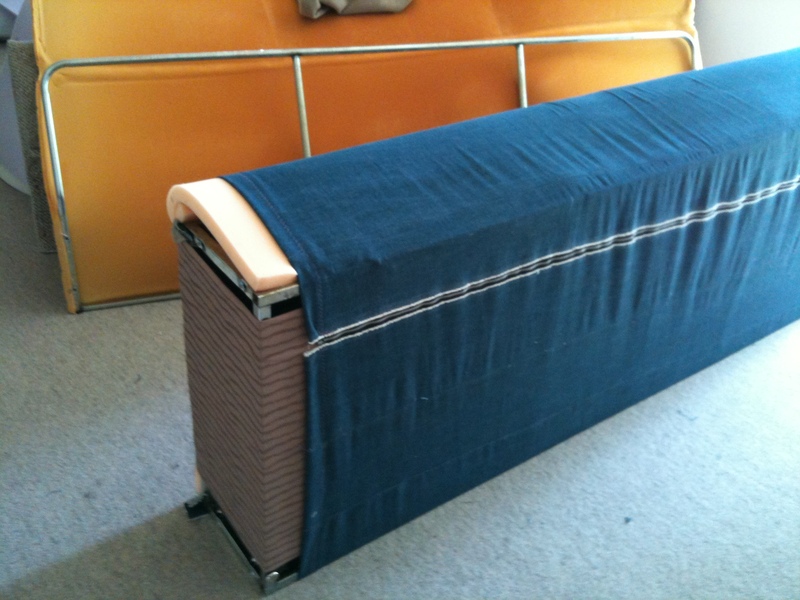 Therefore you’ll need to cover the base with a zippered cover.If you are doing all this work, you want the cover to be removable for washing, so you can sit on it and eat while you watch TV. If you are doing all this work, you will need to get cable so you can get some use out of the sofa, by watching TV. I recommend that you get the TV and cable just before you start the project, so you can watch TV while you rip out seams and contemplate the next move. Didn’t know what to do here. Fabric was too stretchy. Had to poke holes through it for screws, and reach in behind the black to put on bolts. Husbands never get excited about a new sofa, even when it is as beautiful as this one. It is rather like asking “Does this sofa make me look fat?” He will know that there is only one acceptable answer, so you will never know if he meant it or not. He is not a complete idiot and quickly tuned into the fact that liking it was not optional. Nevertheless, I am very pleased with it. 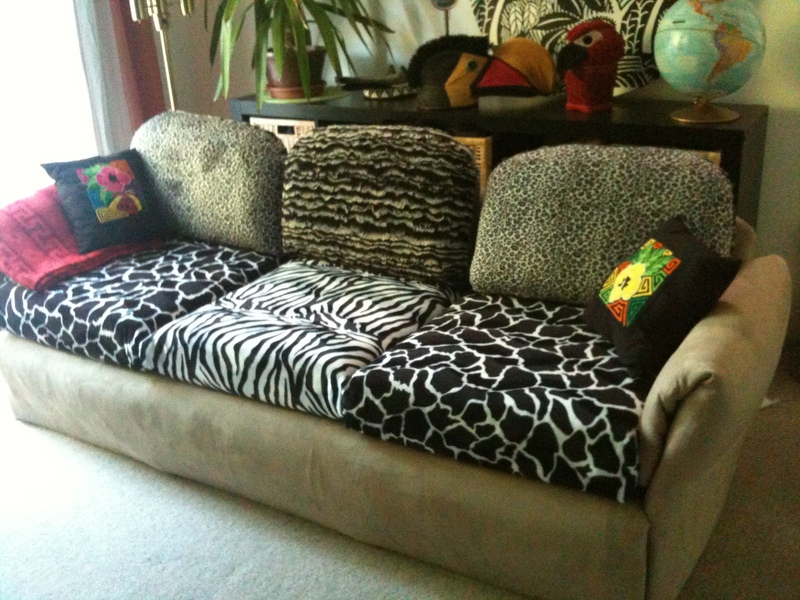 If I get tired of the animal skin print, the cushions are the easiest part to re-do. By the way, the base (tan coloured) fabric is called “Elephant skin.” It is a suede-like upholstery fabric made of polyester, backed with a thin foamy layer. Well done, You! Nice post, too. Thanks. It was a lot of work for a post! You’ve outdone yourself, Clare, with this example of radical upcycling. The assorted animal prints strongly suggest a safari theme – turn the globe to Africa, please. Coincidentally, I also bought a new world map for the wall near the sofa and I brought a globe up from the basement. So I CAN turn the globe to Africa. I’ve never been there but should consider it now! Very “Urban Utilitarian” in keeping with your own signature style. I am curious if you are able to design some wardrobe pieces from leftover material? I’m impressed, Clare! That was indeed a lot of work – you have good reason to be proud. I bet the revamped sofa got lots of use last week! Thanks. It sure did get a good workout, positioned as it was in front of the Olympic broadcasts.